Due to an overwhelming amount of request, all our car rentals at Globe in Montreal and Toronto are Smoke-Free! To help ensure that our vehicles smell fresh, we ask our clients to refrain from any type of smoking (marijuana, pipe, cigarette, cigar, etc…). Also kindly, if you are transporting your pet in the rented vehicle, please do so by using a cage as some of our clients are highly allergic to some animals. Tobacco smoke emits a pungent smell that becomes residue on fabrics, fibers and car surfaces, emitting a strong odor that the majority of car renters find to be unpleasant and/or have allergies. Globe greatly appreciates your consideration for the next client who rents your vehicle after you. Kindly note: our smoke-free policy is an extension of our policies concerning excessive pet hair, interior abuse or heavy soil. We expect all those guidelines to ultimately benefit all renters, including those who smoke. Every renter deserves new, safe, clean and fresh-smelling car! Please help us make the car rental experience a pleasant one for our community. 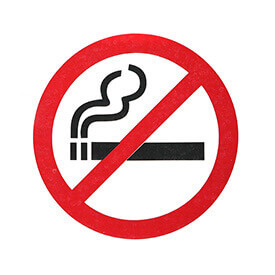 A cleaning fee of $250 will be applied should smoking in the vehicle occur during the rental period . Please respect others who don’t smoke and who have smoke or pet allergies.